The lives of a certain group of first-responders aren’t going to be getting any easier during the 2019-20 season. FOX has announced that their 9-1-1 TV show has been renewed for a third season. The series currently airs on Monday nights. 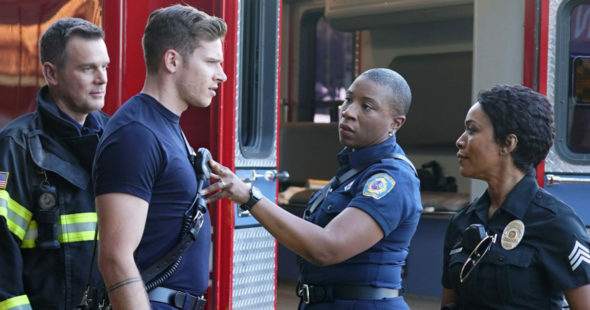 A procedural drama, 9-1-1 stars Angela Bassett, Peter Krause, Jennifer Love-Hewitt, Oliver Stark, Aisha Hinds, Kenneth Choi, Rockmond Dunbar, Ryan Guzman, Corinne Massiah, and Marcanthonee Reis. The scripted series, inspired by real-life experiences, centers on the police officers, firefighters, and paramedics who risk their lives to save others. No matter how frightening, dangerous, and shocking a situation may be, these first responders rush toward crises when most others are fleeing. The second season of 9-1-1 on FOX is currently averaging a 1.47 rating in the 18-49 demographic and 6.22 million viewers. Compared to season one, that’s down by 11% in the demo and down by 2% in viewership. It’s currently the network’s most-watched series and is likely to edge out Empire as FOX’s highest-rated show in the demo this season. What do you think? Do you like the 9-1-1 TV show? Will you be watching season three on FOX next season? More about: 9-1-1, 9-1-1: canceled or renewed?, 9-1-1: ratings, FOX TV shows: canceled or renewed? Great show. Please keep all the actors. Perfect group. Great show. They need to keep all the staff the way it is. Love both these shows, great stories and very watchable actors! Can’t wait for seasons 3 onwards. I cant wait for Season 3 to start.. I LOVE this show. I will defo be watching season 3. Love the programme. I love this show and pray that there is a season three. I love this show it’s exciting excellent character skillls with the acting and is always intriguing and I love all the actors I can’t wait fur season three. My favorite show. I REALLY LIKE 911. PLEASE KEEP AIRING THIS SHOW. I just love love both 911 and The Resident!!!! 9-1-1 and the resident are great shows?? ?